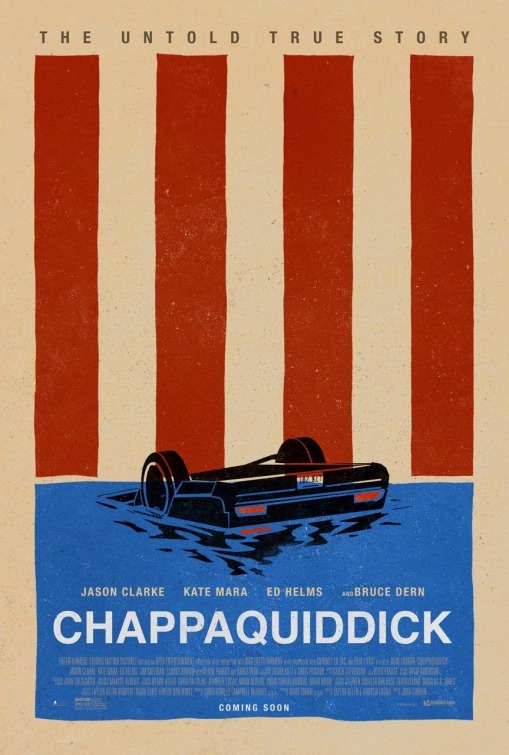 Chappaquiddick tells the true story of a political scandal that ended the presidential run of Edward “Ted” Kennedy in 1969. Kennedy, brother of President John Kennedy and candidate Bobby Kennedy, was planning a run for president in 1972 when his car went off a bridge into the water, claiming the life of a political strategist Mary Jo Kopechne. According to the scandal, Ted left the scene of the accident and did not report it for 9 hours, thus leaving Mary Jo to die in the submerged car. Ted Kennedy, played here by Jason Clarke, is shown as a damaged man who was desperately seeking the attention and approval of his father Joe (Bruce Dern). Too drunk to be driving, Ted drove the car off the bridge. However, the film does not show us how Ted escaped the car or why Mary Jo (Kate Mara) could not. According to the film, Ted retreated to the party that he had come from to find his two friends/associates Joe Gargan (Ed Helms) and Paul Markham (Jim Gaffigan) to help him. They returned to the scene of the accident and tried to get into the car to save Mary Jo, unsuccessfully. Joe and Paul left Ted with the expectation that he would report the accident, but he does not until the next morning. The film indicates that Mary Jo survived for a while breathing in a small pocket of air in the car. Had Kennedy called immediately, would she have survived? He certainly believed that after he and his friends had returned that she was already dead, thus reducing the immediate need. This was still left up in the air for the audience to infer what happened. The film also played with the spinners after the event happened. They were coming up with reasons why this had happened and how they would make it not destroy Kennedy’s career. They kept claiming he had a concussion and was in shock. Though the film hinted that that was not the case with a flash to the face of the doctor, I do believe that the film showed Kennedy in a state of shock after the events happened. Maybe not concussed (though I would believe it), but certainly diminished. Was he thinking straight? I don’t know. The performances were strong. The story was well tole, but it did feel as if there could have been so much more to this story than what we got. Maybe a mini-series on TV would be more effective. What the film does very well is show the character of Ted Kennedy and the drawbacks he has. The relationship between Ted and his father was very compelling and I could have used more of that. It really was a psychological character study of a man who some believed would be president, but who failed to live up to the dynasty of his family name, especially inside his own head. Ted’s lack of confidence lead to this entire situation, while the strength of his last name led to the lack of results in the criminal case. I think there is no doubt that this prevented Kennedy from becoming president. I still wonder how Ted Kennedy escaped from the car while Mary Jo did not. There are several questions in this film that are left unanswered. Sure it would have called for speculation, but some of that would have helped the overall quality. Still, good performances, in particular from Jason Clarke, Ed Helms and Bruce Dern, carry this to a decent biopic.